American deployment of ballistic missiles on the Turkish border with the USSR had the Soviets very shaky. 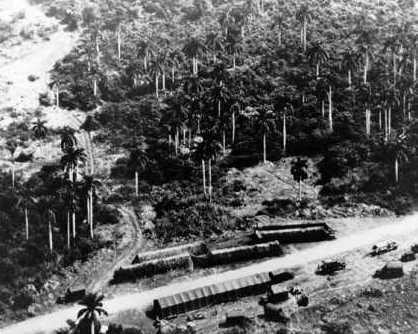 As far as they were concerned, the invasion of Cuba known as the Bay of Pigs gave them the right to establish their own bases just as close to the United States. This would then up the ante in the political stakes so that they could demand reduction of bases in Turkey . Unfortunately, the Soviet military agreed with him and claimed to have proof of such a plan. Fidel asked them to provide “strategic defensive weapons.” The Soviets began shipping strategic weapons to Cuba in early 1962. They put pressure on the Cuban government to ask Khruschev for nuclear arms. The ports in Cuba were closed and a general curfew announced while the missiles were being delivered. On October 14, a U-2 spy plane over western Cuba discovered the missile sites. 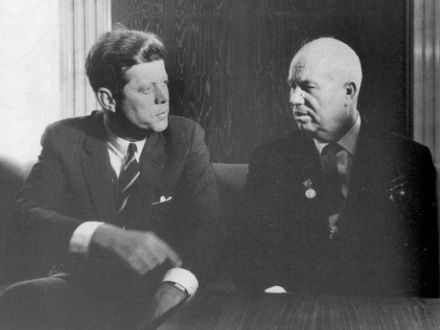 President Kennedy demanded that Khruschev remove them, but he refused. This blockade was so that no further shipments of arms could arrive. He announced this quarantine on October 22 and warned that US forces would seize any offensive weapons that the Soviets attempted to land on Cuban soil. As he was speaking, 54 Strategic Air Command bombers took off. Polaris submarines put out to sea and a US naval task force set out to cut off Soviet vessels and blockade Cuba. There was an escalating series of messages between Kennedy and Khruschev. The world sat on edge, unable to comprehend all that was happening. On October 24 the US military went to DefCon (Defense Condition) 2... for the first and only time in its history. In the midst of this hysteria and chaos, the USS Beale dropped depth charges on Soviet submarine B-59, unaware that the sub had nuclear-tipped torpedoes on board. Full-scale nuclear war seemed inevitable. But in the following days, Soviet ships on course for Cuba veered away from the quarantine and there was a worldwide sigh of relief. The heads of the American military pushed Kennedy to bomb Cuba and take out the missiles, believing that the Russians would not respond because the US was far better armed. Things got very sticky on October 26 when Thomas Powers, commander of SAC, ordered a launch of an ICBM from Vandenburgh Air Force Base to the missile test range in Kwajalein atoll in the Marshall Islands. He then ordered that SAC bombers fly past their turnaround points into Soviet territory. They were recalled at the last moment when Khruschev finally broke... and ordered the missiles removed from Cuba. It has been reported that Fidel Castro pushed a Soviet missile button on October 27 and shot down an American U-2 that had appeared on the radar screen while he was touring the Russian missile sites. Castro denies that he was the one who shot down the pilot, Anderson. But there is no doubt that he was extremely angry that Khruschev had capitulated to the Americans. The world had sat glued to their television sets during this Cuban Missile Crisis, waiting for a nuclear holocaust to erupt. President John F. Kennedy and U-Thant, the United Nations Secretary General, reached an agreement with the Soviets to dismantle the missiles in exchange for a no-invasion agreement. The Cuban Missile Crisis was over.